I don’t get really passionate about a lot of issues, but one thing that does get me riled up is childhood obesity. Childhood obesity has more than tripled in the last 30 years and if the current trend continues, by 2040, 70% of adults aged 40 years will either be overweight or obese. And the worst part? In most cases, this is entirely preventable. Recently, one of my coworkers began volunteering with a charitable organization called Girls on the Run. Girls on the Run helps girls in Grades 3-8 improve self esteem, health and confidence all through the power of running. The after-school program teaches girls life lessons and creatively integrates running. It ultimately culminates in a 5km run or walk event in the Spring. They say that after being involved in this program, girls have higher self esteem, improved eating attitudes, an improved body image and a positive peer group and role model for the future. As soon as I heard about this program, I knew it was one I should get involved with. While the program can certainly help with issues of childhood obesity, the benefits extend so far beyond that and truly have the potential to be life changing for the girls involved. Recently, they held their Girls on the Run One Night Kickoff event as a fundraiser for the upcoming spring 5km. The dress code: formal wear and runners. So I put on my party dress and my fave pair of Nikes. It may have looked strange, but my feet were sure happy! Tracy Moore, host of Cityline attended the event. In addition to being an avid runner, she’s also a passionate advocate of the program. While the program helps build self confidence, she also said it inspires girls to be active for life and many continue running well after they’ve completed the program. Even though I didn’t win anything in the raffle (boo! ), I left the event feeling totally inspired. I went home and immediately filled out the application to be a volunteer on race day for the 5km race in June. It’s going to be so special to see these girls cross the finish line with huge smiles on their faces I can’t wait to be a part of it and congratulate them on their amazing accomplishment. If you want more information on Girls on Run, check out their website here, or follow them on Facebook or Twitter. 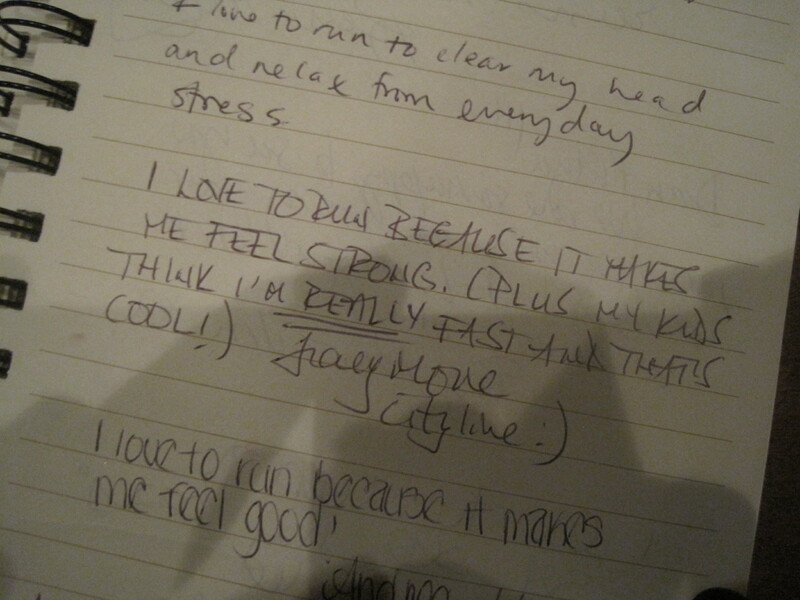 Everyone at the event was asked to sign the book and say why they love running. This is what Tracy Moore, host of Cityline said. 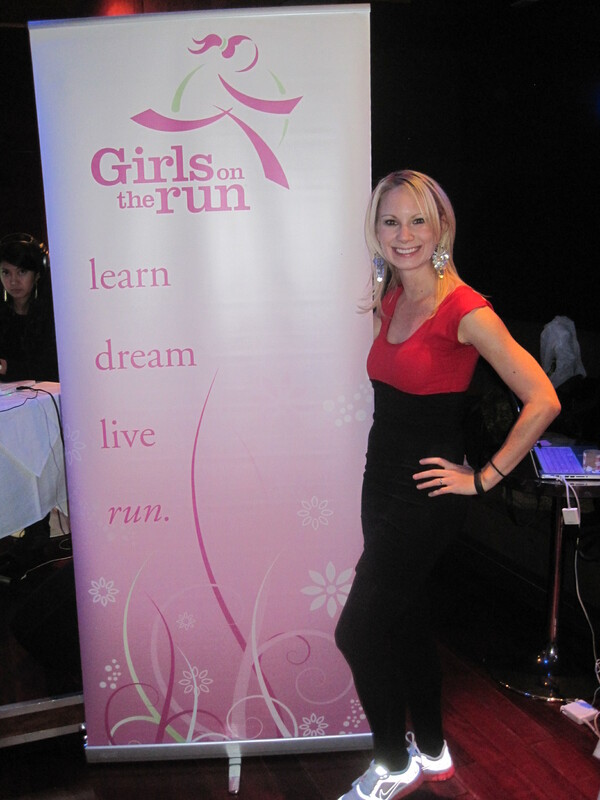 Girls on the Run is beginning to start up in Ottawa so I am hoping to get involved with it too! Nice! I’m on board to volunteer for their race in June. I wish I could commit more time though!